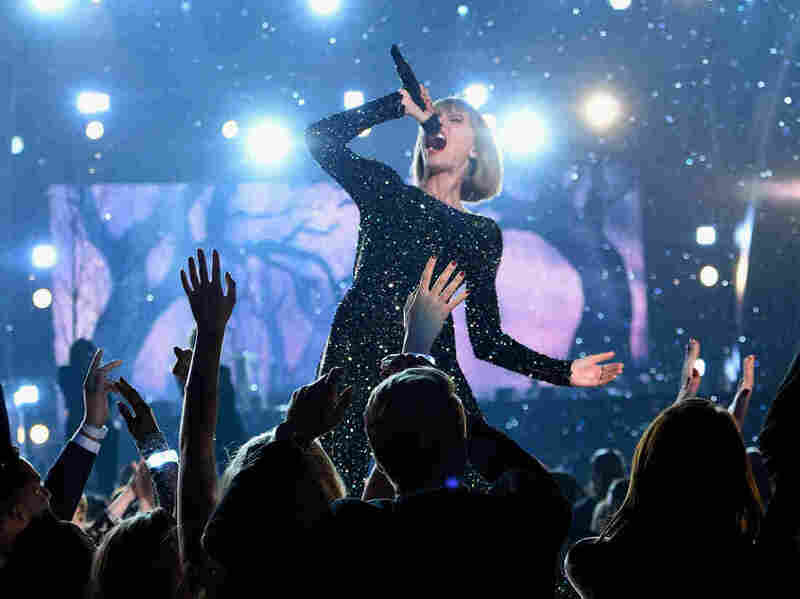 Why Taylor Swift Is Asking Congress To Update Copyright Laws : All Tech Considered It's an ongoing standoff between musicians and Google's YouTube: Who should be responsible for removing unauthorized copies of songs posted online? Congress is in the midst of a review of the copyright laws to make sure they're up to date. Some of the recording industry's biggest stars, among them Taylor Swift, Katy Perry and Paul McCartney, recently signed a letter urging lawmakers to make reforms. The artists say that aspects of the law that were written in the late 1990s make it too easy for tech companies to ignore rampant piracy on their sites and put too much responsibility on the artists themselves to find the illegal music files. It may be hard to feel sorry for high-profile artists like Taylor Swift — but you might feel bad for Sam Rosenthal, who runs a small independent label, Projekt Records. He's been making a living as a musician and producer of electronic music for 30 years. Over the past decade, he says he's struggled to keep his business alive. Is Transparency The Music Industry's Next Battle? "It involves continuously finding more ways to save and downsizing. And trying to keep ahead of the decline basically," Rosenthal says. "I had 11 people working for me in the '90s and now I have two part-time people working for me." "He's pretty much lived his life to create art. He is really dedicated to it," Rosenthal says. "He puts a lot of time into his work and also money into the studio to have the best possible album." And that used to pay. Rosenthal says Roach's albums regularly sold 50,000 to 60,000 copies. But that was before the days of massive file sharing on the Internet. Now, a quick search on Google will take you to sites where you can download copies of Roach's music for free. And here's where Rosenthal gets angry about copyright law: Google is not responsible for taking down links to the pirated song unless Roach or his label let Google know it's there. Rosenthal says it's tough to play Internet detective for all the artists on his label, especially when every time one illegal link gets taken down another one pops up. "It's a really unreasonable expectation," he says, "that I would have the time to chase people all day when I should be running a business and making music." "It was a system designed for a different age," admits Jim Burger, a copyright attorney who represented tech companies at the time. "It's like traffic rules for carriages with horses, and you have autonomous cars now." When the law was being written, Google had just been founded and YouTube didn't exist. "The concern that Congress clearly had in mind was it did not want to throttle or chill innovation and expansion of the Internet," Burger says. "And they didn't want the overhang of copyright lawsuits." Actually, representatives of Google's YouTube say the video service does do something. Artists can register their songs with Google's Content ID, which locates uploads of their music and lets artists run ads over those videos. "Ninety-five percent of the time they're choosing to monetize it, which means they share the revenue," says Katherine Oyama, legal counsel at YouTube. But according to the Recording Industry Association of America, YouTube saw a more than 100 percent increase in the number of video plays last year, but the music industry saw only a 17 percent increase in the revenue sent to artists. The organization says these figures show that the tech companies gain more from the artists than the artists get in return. Plus, Content ID tracking doesn't work for Google search, which artists say continues to bring up links to sites that list pirated versions of their songs. Hollens thinks people who've been in the business for a long time just need to learn how to get their music in all the right places and bring in different streams of income. It may be that it's just too hard for older musicians to learn the new business. But Rosenthal and others say that it should still be up to them to control where the music they've worked so hard to create shows up. Rosenthal doesn't think he and other artists should have to bear all the responsibility for finding every place on the Internet where their music is put up against their will.